Cyber Security is a complex and rapidly growing industry. A key component of that industry is the Threat Intelligence or Cyber Intelligence sector. This presentation is a non-technical introduction to threat intelligence. Our objective is to provide you with tools for applying intelligence. Our longer term objective is to increase the understanding of intelligence concepts and processes, enabling you to improve your cyber security. Cyber space is composed of, and dependent on, supply chains. Our hardware and software are created in multiple locations by a multitude of suppliers and vendors. A single PC board may contain chips from many different nations, each with their own companies and manufacturing plant. Software is highly dependent on updates, which we receive mostly automatically and is directly incorporated in the software we depend on daily. We, as a society are getting more skilled at protecting our technology from cyber-attack by hardening our network perimeters, improving anti-virus/malware tools and encrypting everything we can. The one thing we DO NOT do is evaluate what our cyber supply chain(s) are. We understand their importance to our daily tasks, to our lifestyles, and to our incomes. We need to looking into what our supply chains really are, understand their functionality and investigate ways to begin protecting them. 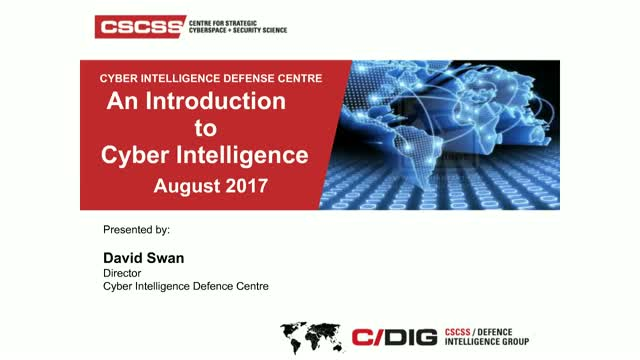 This presentation is an overview of “Making Intelligence Work,” a training program offered by the Cyber Intelligence Defence Centre. When correctly employed, intelligence provides direction for long-term planning (strategic intelligence), direction in the current cyber battlefield (operational intelligence) as well as direct support to defend against current attacks (tactical intelligence). This guidance is developed in the executive suite and is deployed into the organization. The program provides executives with the tools to deploy and utilize intelligence in their organizations. In order to protect your organization from cyber attacks, you need to understand who your enemies are, and how they see you as a target. This means turning your vision and your intelligence capabilities on yourself and taking a very hard look at what makes you worth attacking and what your vulnerabilities are. - How well trained and prepared is your staff for an eventual attack? - How much financial, reputation and regulatory damage can you afford to suffer? - Is your organizational culture built to learn and adapt rapidly without wasting time and energy on blaming others? - How would your external stakeholders respond to your being attacked? - How would you be affected by attacks on other parties in your ecosystem (or vice versa)? This all takes hard work, but is likely to ensure that when – not if – you are attacked, you will have a much higher chance of survival. With malware, phishing and zero day attacks becoming more sophisticated, it’s impossible as a business to be 100% secure against a breach. As numerous high profile cases have demonstrated over the past year, breaches can cause serious reputational damage, particularly if customer’s personal details have been jeopardised or private business information has been leaked. Preparing for breaches is part of good governance and requires close coordination between management, cyber security professionals and your communications department. This presentation will discuss the best practices for preparing for breaches. • Provides models for best practice governance, including the coordination of governance, cyber security professionals and communications. • Explains how to put together a risk management plan. • Examines different strategies for communicating breaches and their merits. With cyber attacks increasing in frequency and impact, it is critical to understand the barriers to the development of international norms of behavior in cyberspace, the deficiencies in the law and the challenges faced by governments, the private sector, and international organizations including the United Nations and the North Atlantic Treaty Organization (NATO) in defining thresholds for a domain with various levels of entry. This presentation will define the various aggressors in cyberspace based on the type, purpose and impact of the attack, and then analyze how they are regulated by existing laws including international treaties, the law of war, and domestic civil and criminal law. The boardroom understanding what ‘cyber security’ really means, is going through a radical transformation. In many ways, our business leaders are a little late to the table for this particular feast, but their leadership and strategic thinking are vital if they are to steer their business ships through the challenging cyber-waters ahead. Research shows that many boards are well behind the joined up thinking demonstrated by cyber-criminal groups. But what does this mean for the business world at large? This presentation addresses how the international adoption of smart technologies and the increased reliance on networking them in cyberspace has increased cyber attack risks for "Smart Cities." Smart Cities are urban centers designed to integrate cyber technologies and physical infrastructures to create environmental and economic efficiencies while improving the overall quality of life of its citizens. While the benefits of Smart City technologies are well recognized, the risks associated with cyber-physical system integration in urban critical infrastructures is not well understood. Smart City system integration has increased the cyber attack surface immeasurably for malicious actors to exploit ICT vulnerabilities to create cyber attacks which can disrupt essential services, physical damage equipment, or cause loss of life. This presentation focuses on the types cyber attacks that are possible against Smart Cities and the consequences when directed at Transportation Systems, the Electrical Grid, Water Supply, and Wastewater Disposal critical infrastructures. With cyber attacks on the rise and high-profile breaches becoming the new normal, being on top of the current trends in cyber threats is key to improving your cybersecurity posture. Join this threat brief and learn about the latest threatscape. David Swan, Director of the CIDC will discuss the top cyber security headlines, identify some emerging trends and provide analysis and forecasts of hacker activity. Join this presentation to learn the facts about the recent Distributed Denial of Service (DDoS) attack on Dyn. Discover the impact of the attack, and the likelihood of a repeat attack of the same or greater magnitude. Richard Zaluski, President and CEO of CSCSS and David Swan, Director of the Cyber Intelligence Defence Centre will discuss the causes behind the Internet outages on October 21 and the implications of the attack. Cyber attacks are on the rise, and financial institutions are increasingly becoming targets of sophisticated attackers. Join this presentation and learn about the current cyber-attacks affecting the industry. David Swan, EVP of the Defense Intelligence Group will discuss current attacks, attack trends and forecasts what banks and other financial institutions can expect in the near to middle term. Established in the United Kingdom, the Center for Strategic Cyberspace + Security Science is a bipartisan, multilateral, international nonprofit organization headquartered in London, United Kingdom. It seeks to advance global cyberspace security and prosperity by providing strategic insights for cyberspace and policy solutions to decision makers.